Prior to sunrise, your guide will take you on a journey through a striking desert landscape to the entrance of the Uluru-Kata Tjuta National Park. As the sun begins to color the horizon, you’ll travel 40km (25 mi) through the parks breathtaking scenery to the massive, domed rock formations of Kata Tjuta. As the desert landscape comes alive with the sunrise, your guide will lead you to the best spot in order to watch the 36 rock domes turn dramatic shades of red and orange. 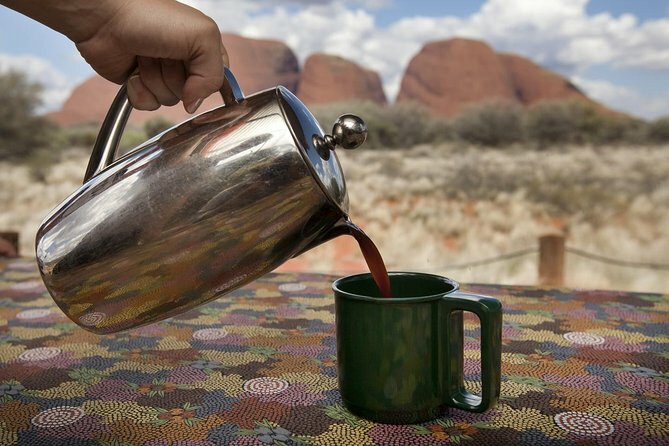 Following this magnificent, awe-inspiring experience, you will walk to the western side of Kata Tjuta for a delicious, outback picnic breakfast. Listen for the sounds of the desert as you enjoy your meal, and soak in the peaceful aura of one of Earth’s most amazing natural monuments. After breakfast, your tour continues to Walpa Gorge. Here, your guide will tell you about how Kata Tjuta and the surrounding rock monuments came to be over eon upon eon of constant weathering. Take time to listen to the wind (Walpa) far above and view the scale of the rock walls that surround you. The spirituality of this amazing location embraces everyone who ventures here. Following your 5-hour journey, your guide will return you to your Ayers Rock Resort hotel. Our tour to Kata Tjuta sunrise was brilliant. Even though it was drizzling rain at times and overcast, it was still great. Our tour guide Nadia was excellent, we learnt so much about everything and anything to do with Kata Tjuta, Uluru and surrounds. Breakfast was delicious. The walk into Walpa Gorge was stunning and really worth while. Loved the small group experience too. Couldn't fault anything, it was great from start to finish. Wonderful, small group and the two guides Emily and Shanna were brilliant in terms of cultural, historic and botanical knowledge. This dawn breakfast tour was unique. The trekk was not conplicated at all, but very interesting specually because our guide Emily was so fun to hear when she told us the stories behind the magestic Kata Juta formations. The flies where really annoying, but despite that the entire was really interesting and fun. The tour was convenient and Dan, our guide, did a great job. We had wonderful views of Uluru during the sunrise, had a nice breakfast of fruit toast and cereal, and then learned some of the local geography prior to taking a hike at Kata Tjuta. We saw a couple of kangaroos as well! I enjoyed it totally. The walk is easy and the view is extraordinary. The guide gave us good and interesting information of the rock formation, the plants and aboriginal traditions. Excellent trip, well organised,Kylie the guide was knowledgeable and friendly. Good breakfast and small group size meant we were all included in the commentries and information well. Highly recommend. Great small tour. Learnt a lot.. Tour guide very knowledgeable and helpful. Thoroughly enjoyed; however, I didn't have access to the park with my booking, and had to pay an extra $25.00. This should automatically be done when I book the tour. For the first part of the tour you visit a sunrise view platform where one gets great views of the sun coming up behind Uluru and over the Olgas. It was cold and windy, so the walk up Walpa George was a little tough on us older folks. Worth seeing once. Enjoyed the guide.